Autonomous flying vehicles carrying commuter’s around a major metropolis? The days of this being a reality solely reserved for the cast of Futurama are seemingly numbered and Dubai is leading the revolution. Dubai has declared their first ‘Volocopter’ test a success in what is a landmark moment for autonomous transport. The Volocopter is an 18-rotar, two-seat drone taxi capable of carrying two passengers through the air and around the city for up to 30 minutes at a time. The clean energy drone isn’t due to come online until 2030 but it got us thinking of some of the crazy ways people can get around in 2017. Have you experienced any of these? What the three-wheel Vietnamese rickshaw lacks in speed it makes up for in entertainment. Vietnam’s two biggest cities, Hanoi and Ho Chi Minh City are both infamous for their liberal approach to the rules of the road and these three-wheel bicycles give tourists a front row seat to the madness! A race with a mate through Hanoi + a GoPro = epic laughs. This is one for the sci-fi nerds. Despite sounding like an obscure Russian MMA fighter, the Maglev actually stands for ‘Magnetic Levitation’ and is the world’s fastest train. This total speed demon reaches a top speed of 431km/h and completes it’s 30km journey from Pudong Airport to Shanghai city centre in just 7 minutes. What a beast! A must do for anyone visiting Shanghai. Another absolute weapon of a thing but this time on the water. Opened for business in the idyllic surroundings of Queenstown on the South Island, the Shotover Jet roars through the river canyons at break-neck speeds giving you a big thrill and some spectacular if somewhat blurry scenery. Reaching speeds of 85km/h on the rapids, you don’t wanna be susceptible to sea sickness! We probably need to slow down and re-arrange our facial features after the last two so we’re heading to South America and the iconic Lake Titicaca. For generations, the locals have built and relied on these incredible ‘Reed Boats’ to fish and move around the floating villages of Lake Titicaca. The boats, made entirely from locally found Totora reeds have been used as far back as the Inca’s as a means of transport. You’re not going to go anywhere fast but who would want to when you’re surrounded by Andean bliss. Getting their name from the obvious resemblance to the fruit, these are great little speedsters for getting around Havana. Transport in Havana is epically cool with so many 1950’s American muscle cars around but this quirky little service is our favourite especially as they’re cheaper than almost all taxi’s. An added bonus is that you get to feel like you’re in an episode of Wacky Races racing through the Havana streets too! 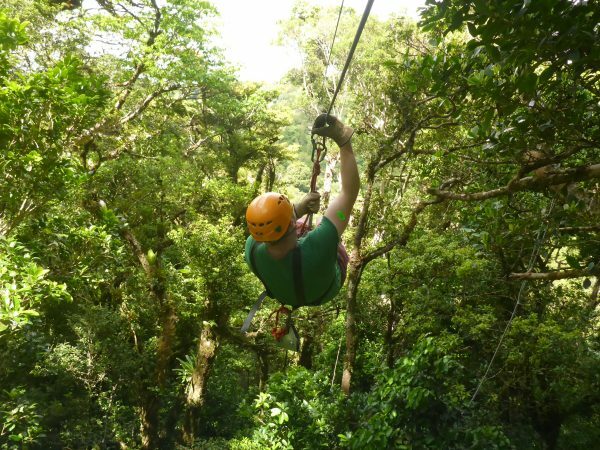 High in the Monteverde Cloud Forest is a totally unmissable way to see the Costa Rican jungle. Ziplines!! The lush, thick jungles are absolutely teeming with life from toucans to monkeys, snakes to tayra’s and if you’re incredible lucky you might even spot a jaguar (he’ll definitely spot you first). Seeing the world as the magnificent birds of the Cloud forest isn’t something you’ll forget in a hurry, with the longest line over 1.5km in length slinging you out like Superman. Another final bonus round is the insanely fun but initially terrifying 90ft Tarzan swing at the end. Take a lead of faith and give it a big roar, you won’t regret it! Poor little Europe is getting no love but we couldn’t leave out the iconic Gondola ride through the Venetian streets. Doesn’t get much more romantic. You can’t blame a spike in heart rate on the speed. Magical stuff. Not only are huskies the most impossibly funny and loving companions, they are also total legends through the snow! There is no ‘I’ in ‘team’ and nor is there one in ‘Husky’ and don’t these guys know it. Not only is it a brilliantly unique way to see the landscapes but belly rubs are the least concerning mandatory aspect of pretty much any activity you’ve ever heard of!